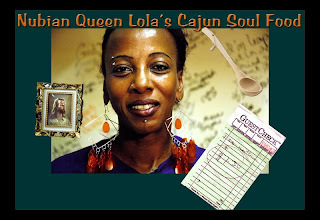 After reading the Statesman story about restaurateur Lola Stephens-Bell handing out ice water to Austin’s homeless to cool them down on these 100 degree and higher days, I knew it was finally time to check out her place, Nubian Queen Lola’s Cajun Soul Food. A group was quickly formed via Twitter and e-mail, and I called Lola to make a reservation for 7 p.m. the following night, a Tuesday. 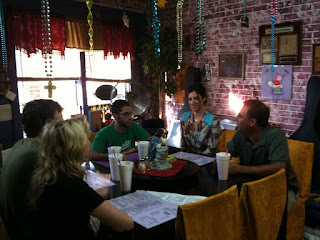 The group included me and Adam, Ilyse, Darrell from Bella Verdi Farms, David and Betsy, and Jennifer and Roderick. When we arrived, Darrell was there and we introduced ourselves as we were meeting for the first time. Darrell and I follow each other on Twitter and it’s always fun to meet a friend from Twitter in real life. He had just learned that Lola closes at 7 p.m. on Tuesday nights but that she was staying open just for us. The restaurant is run mainly by Lola but one of her daughters was there to help. They offered us “Cajun iced tea” and “Cajun lemonade” and Adam and I tried one of each. The lemonade was a bit too sweet for us but Lola’s special iced tea mixed with juices was magical and refreshing. The menu is huge and Lola helped us order so that we could share everything. We tried chicken and sausage gumbo, shrimp etouffee, hamburgers, french fries, corn bread, mac n cheese, candied yams, red beans and rice and piping hot beignets to top it all off. People go to fancy restaurants all the time for the “chef’s table” — sitting in the kitchen and getting to know the chef. 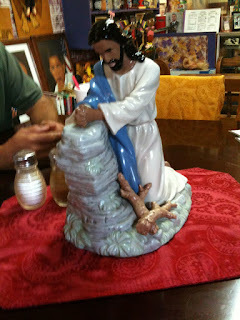 That is the kind of experience we had at Lola’s. She greeted me and each of my friends with big hugs even though it was our first visit, talked to us at length and offered us drinks as if we were there for a dinner party. 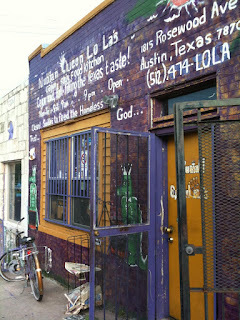 If you have read the reviews on Yelp, you know that a meal at Lola’s should not be rushed. She is mostly a one-woman show, with a little help from her daughter, and is the hostess, waitress, chef, line cook, busser, dishwasher, and cashier. 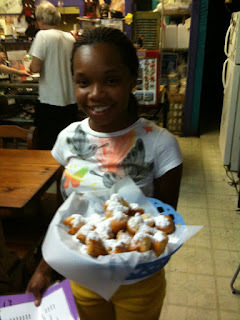 The food came out when it was ready and we passed everything around and happily tasted the complex and smokey gumbo, tasty hamburger, rich etoufee, satisfying side dishes, and hot and fluffy sweet beignets. She embodies humanity and grace and impressed each of my friends with her spirit. The final bill for dinner was $15 each including tax for a meal that gave us so much more. There are times after a meal where I feel I’ve been cheated when I see the final bill — prices are inflated, the service surly, and the food prepared in haste. At Lola’s, the experience is the exact opposite of that. It was truly a deep and moving opportunity to see how Lola truly embodies a giving spirit in everything she does. Do yourself a favor and spend some time with Lola and her delicious food, warm personality, and quirky style and you will be thankful that you did. While you’re at it, leave a little extra to help support Lola’s good works. We left 100% tip that day and it felt great. Lola gives over 100% every day of her life and from what I saw, that feels amazing. Listen to 107.1 KGSR FM next Wednesday, July 22 at 8:30 a.m. CT to learn more about Lola’s background and maybe some tips on real Cajun cooking. 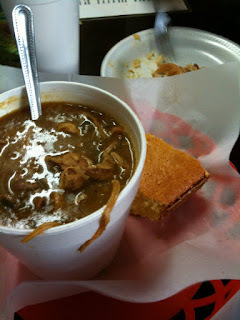 Please try the gumbo, burger, and corn bread.,,,that and the warmth and joy of the owner are worth the wait! Thanks, Jod, for putting your VIP status to good use and getting us in on a Tuesday night! this is such a great review! Lola sounds like the best restauranteer ever. Sounds like a really special meal, what a neat lady. Great review. We'll have to check it out! Thanks. I love Lola's. You walk into her place and straight into the heart of New Orleans. It's not a themed restaurant, it just spills over with who she is and what she loves. It's a real treat for Austin to have a place like this. It doesn't hurt that she served me the craziest shrimp po' boy I've ever had in my life. It was a work of modern art. I've heard great things about this place and this confirms it. I'll check it out next time I'm in NOLA!